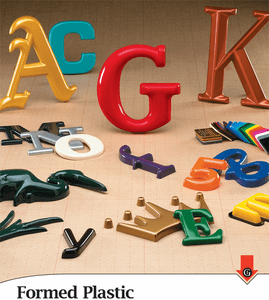 The original “Gemini Letters” Formed Plastic letters are the most popular and durable product in the sign industry today. The utmost in versatility, Gemini’s guaranteed-for-life Formed Letters are the standard for most local businesses as well as office parks, retail chains and almost anywhere there is a need for dimensional signage. Their inexpensive molds make it easy to customize a letter style or logo for the perfect 3-D sign.